We can never agree on gear here at Bike EXIF. Chris won’t leave the house in anything less than a full-face helmet and head-to-toe armor, but I’ve been known to rock an open face and t-shirt on occasion. But we agree on one thing: if you’re going to buy gear, buy good gear. So, rather than our usual ‘New & Noted’ round up, we’ve decided to bring you pukka, real-world gear reviews. Here’s a look at some of the stuff we use, love, and would recommend to our nearest and dearest. Hand your credit card to your significant other, and read on. Bell Moto III helmet A friend recently asked me why I insist on wearing an open face helmet. “I just like the vibe,” was the best (admittedly lame) retort I could muster. 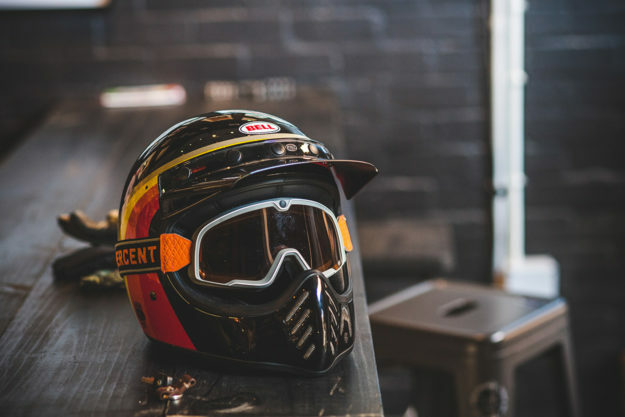 If you also like ‘the vibe’—but want a helmet with modern materials and decent protection—you should seriously consider the Bell Moto III. The Moto III comes with two different liners, depending on which colorway you pick. Opt for a solid color and it’s a proper throwback terry cloth affair; pick one of the graphics, and you get a gorgeous leather and micro-suede finish. 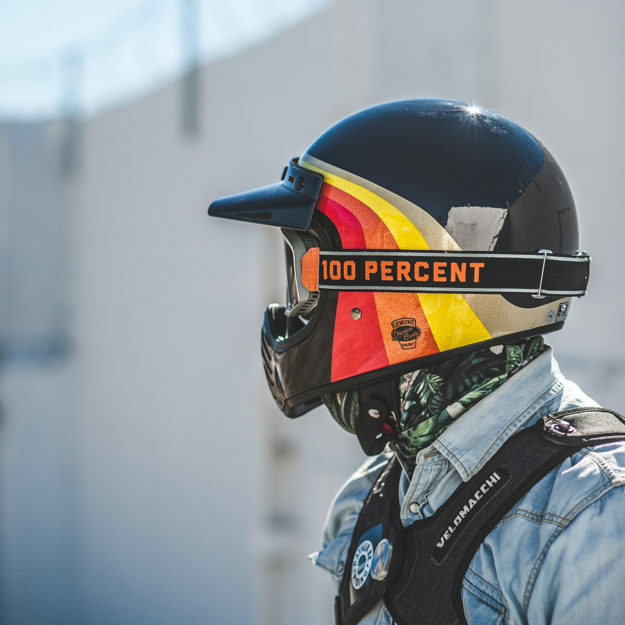 I don’t usually dig graphics on motorcycle helmets, but terry cloth is just a little too period-correct for my liking, so I chose the ‘Chemical Candy’ graphic (pictured here). Chemical Candy’s not just a clever name—it’s the pseudonym of the Texas-based airbrush artist who conceived this design. And I’ll be darned if I didn’t change my mind about graphics the second I took the Moto III out the box. It’s supremely cool, with a deep metalflake finish that pops like mad, and neat little details like perforation and quilting on the liner. Better yet, the Moto III has an extremely compact profile, even on my huge melon. The interior is really stiff out the box though—there aren’t any hotspots, but my ears did feel it the first few times I put it on and off. It’s also pretty hard to squeeze sunglasses in, and it still leaves an imprint on my forehead when I take it off—but does seem to be breaking in. The liner is removable and moisture-wicking, and the helmet fastens with a double-D ring closure, with a press stud to keep excess strap from flapping around. The five-snap system on the peak is rock solid—it doesn’t rattle, and it takes a firm hand to remove and replace it. I did notice a small misalignment on the graphic, but it’s right up top (and only noticeable when the peak’s off). The big eye port will take most goggles; I wear Ride 100%’s rather large Barstows, and they fit with a squeeze. It also lets some air in, along with the mesh chin bar vents—but on a hot day you will eventually find its limits. I’ll level with you: the Moto III isn’t as well vented, aerodynamic or quiet as, say, an Icon Airframe Pro (we’ve got a review coming on that sucker soon). 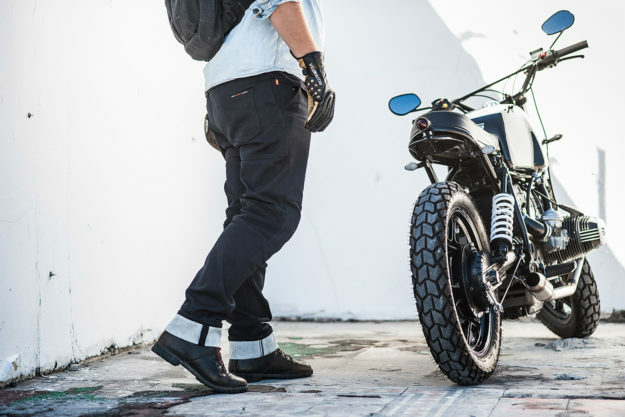 Saint Model 1 Unbreakable jean We’ve been fans of Saint’s gear since day one, for a simple reason: comfort. 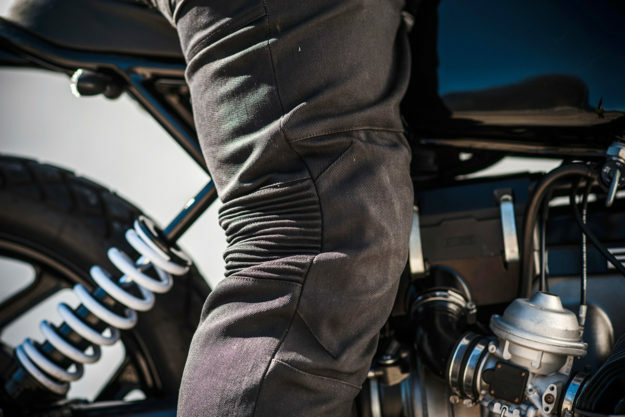 Rather than line their motorcycle jeans with Kevlar, the Aussie company makes them from a single-layer, abrasion-resistant material. So instead of being stuffy and constricting, they’re all-day wearable. Saint’s ‘Unbreakable’ denim is constructed by weaving cotton with ultra-high-molecular-weight polyethylene (or UHMWPE) fibers. That makes it good for a six second, 75 meter slide time. With the Model 1, they’ve added even more protection in the form of removable hip and knee armor: The hip armor is CE Level 2 rated, and the knee armor CE Level 1 rated. The straight-cut Model 1 jeans look and feel like a good pair of Carhartt work pants. The denim weighs in at 14oz, with a coated finish that gives it a heavy-duty, almost canvas-like quality. The overall construction and quality is rugged, and details include a zip fly, belt loops and a subtle Saint ‘wing’ logo embroidered on the back pocket. Sizing is spot-on too: order your regular jean size, and you’re good to go. My other pair of Saints—the ‘Tough’ model—are so understated that they regularly double-up as casual wear, but the overall aesthetic on the Model 1 is a little more ride-specific. Saint has added some extra stitching—and accordion panels—around the knees, to optimize the fit with armor. It works though—I could feel the armor while riding, but it never got in my way. The armor itself fits into mesh pockets inside the jeans, and is easy to remove. You’ve got a choice of two vertical positions for the knees, but I did find that the knee pockets had a touch too much horizontal room—so the pads didn’t always sit dead center. 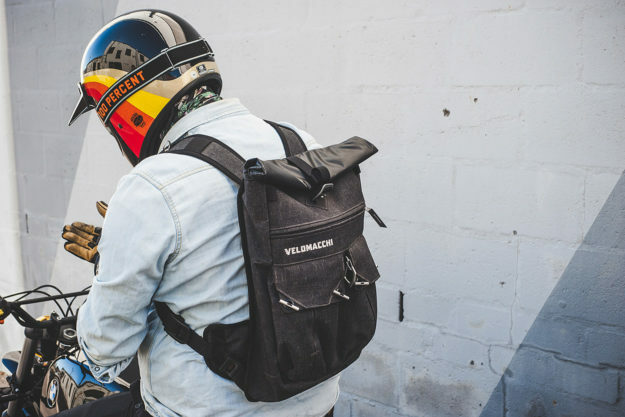 Velomacchi Speedway roll-top backpack Velomacchi is a relatively new operation out of Portland, Oregon, but they’ve come out swinging. 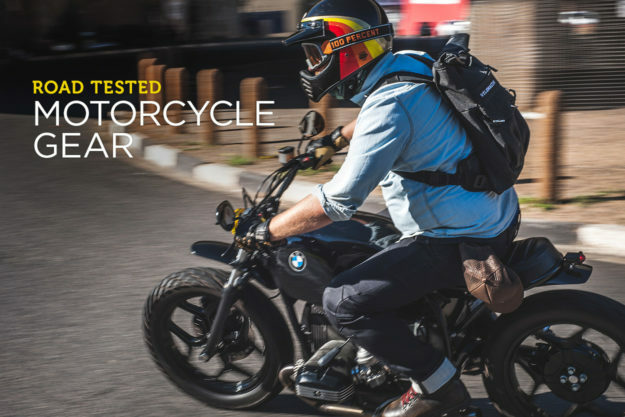 I’ve been riding with their Speedway roll-top backpack for the last few months, and while it does have some shortcomings, it’s one of the cleverest backpacks I’ve used. For starters, it’s tough and it’s waterproof—a winning combination for someone who’s hard on things and paranoid about getting his stuff wet. The chassis is made from a 1000D fabric, and the main compartment seals off with a watertight roll-top closure. There are also two zippered compartments, and two pouches with toggle closures; and they’re all waterproof. I’ve ridden through everything from drizzle to downpour, and always arrived with dry gear. 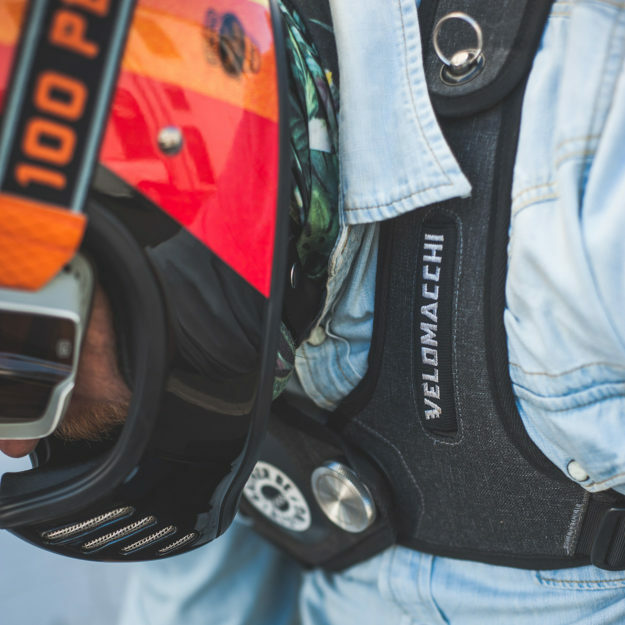 But the real selling point is Velomacchi’s harness system. They call it a 3-point pivot system: The shoulder straps each connect via a pivot point, then meet in the middle to create a perfect fit, regardless of the shape of your body or jacket. The system locks up front via a magnetic coupler that simply clicks in place when you push the two parts together. Twist the knurled aluminum knob, and it disengages. I thought this was a gimmick at first, but after months of use it’s no less functional than it was the day I got it. And the overall design makes for a super-stable pack that never shifts or bounces around, whether it’s fully loaded or empty. Velomacchi has also included a nifty adjustment system, with markings that help you dial in the perfect fit, and strap ends that disappear into hidden compartments, leaving nothing to flap around. A pair of extra buckles helps you micro-adjust the pack depending on the load. I haven’t fiddled with my pack once since setting it up the first time (but I have noticed that one of the micro-adjustment buckles has a tendency to disengage at even the slightest bump). The Speedway’s back panel is quilted for some extra comfort, and behind it is a sleeve for a hydration bladder, complete with a hanger strap to secure it. Velomacchi bills its stuff as ‘privateer gear,’ and there’s a strong enduro influence here—the straps are kitted with details like elastic strips for guiding a hydration hose, a medical ID card slot, a slot for a tire gauge or pen, and a flat plastic panel that can be used to mount a POV camera. And the chunky aluminum helmet clip on the back is a nice touch. On the down side, the Speedway isn’t the biggest pack around. I can generally cram in a MacBook, sweater, notebook, charger(s), earphones, sunglasses, gloves and my FujiFilm X30, before things start to get tight. Which is fine, since I seldom carry more—but if you tend to do the grocery run on your way home from work each day, it might be an issue. It’s also not quick to get in and out of; the main roll-top fastening hook, and the toggle closures on the outside pockets, take some getting used to. Ride 100% Barstow goggles If—like me—you prefer riding in open face or ‘retro’ lids, goggles are a must. Sunglasses are good for cruising along the promenade, but at any reasonable speed the wind takes over, and your eyes start cursing you. Sure, you could grab a pair of standard issue MX goggles off the shelf for less than a new pair of 100%’s Barstows—but if your wallet lets you, these are worth springing for. 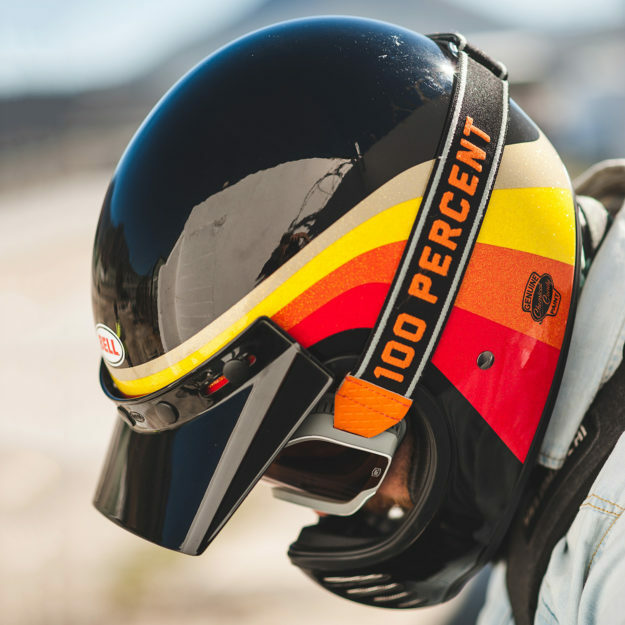 The Barstow basically combines modern goggle tech with retro looks and premium finishes. So you’re getting plush, triple-layered fleece foam for your face, good ventilation and an anti-fog and scratch resistant, tinted Lexan® lens. You also get a spare, clear lens, a soft goggle bag, and a microfiber cleaning cloth in the box. The strap is silicone coated on the inside for grip, the adjustment buckles are metal rather than plastic, and bits like the strap trim are made from leather or suede. Best of all (and the reason I’ve now got myself a second pair), the Barstow is huge. The frame measures at 19cm x 10cm, which makes for an excellent field of view—and the optical quality of the lens itself is great. It also means that these goggles simply won’t fit into some helmets—so that’s worth checking before you buy. 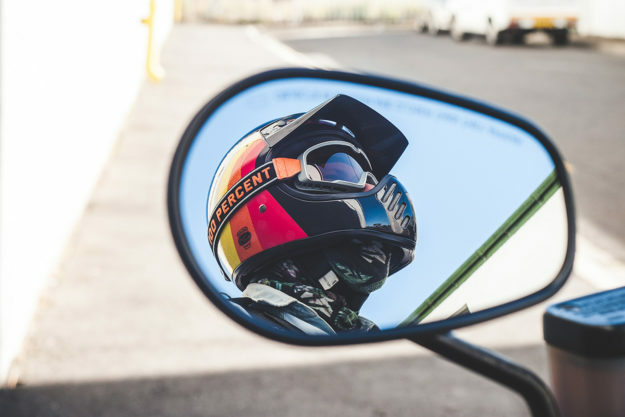 On the Horizon: Icon 1000 Akromont jacket Icon Motosports are known for their loud, hooligan-ist gear—but their Icon 1000 line sits at the opposite end of the spectrum, with a dark, understated ethos. And it doesn’t get much more subtle than the Akromont jacket. We haven’t tried the Akromont yet, but it’s high on our wishlist. Available only in black, it features a textile chassis in a simple layout with minimal detailing—save for stretch panels under the arms, and embossed leather patches on the elbows. Icon give it their ‘level 1’ waterproof rating—which means it’ll be fine for light showers, but not heavy rain. You also get a full complement of D30 armor, and a removable ‘SatinCore’ vest liner. The ends of the sleeves have two-way ventilation zippers with a mesh backing, and there’s a hint of Clarino on the inside of the neck for added comfort. A couple of hand-warmer pockets—and basic Icon 1000 logos on each arm—finish it off. Also pictured: Stylmartin Red Rock boots, Velomacchi Speedway gloves, Holy Freedom neck tube. 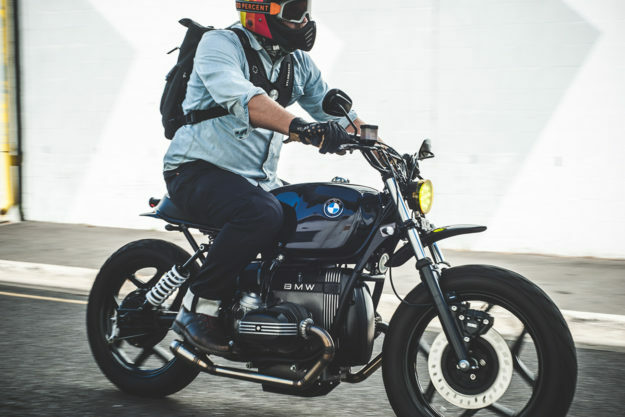 Photos by Devin Paisley, with thanks to Wolf Moto for the loan of their BMW R65.